Jeep 232/258 Inline Six Upgrade—4.5L to 4.7L Stroker Motor Buildup! American Motors’ most significant and enduring contribution to Jeep® was the seven main bearing inline six. While most associate this engine design with ’72-up models, the architecture dates to 1964 and first appeared in 1965 Jeep J-trucks. AMC introduced a variety of six-cylinder engine changes from the mid-‘50s forward, offering four-main bearing inline sixes in L-head, iron OHV and even a short-lived aluminum block design that featured iron cylinder liners and an iron, OHV cylinder head. The aluminum-and-iron combination proved far less reliable than expected, and 1961-65 Rambler 196 cubic-inch, aluminum-block inline sixes required frequent head bolt re-torquing—or inevitable head gasket failure and block deck damage. Lightweight Rambler six-cylinder models stood for economy, and AMC entered the ‘sixties intent on elevating the status of inline six-cylinder performance. 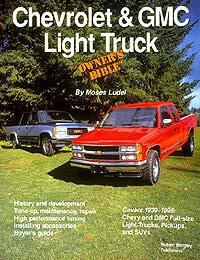 This feat was a significant challenge in an era of V-8 muscle power and cheap, readily available, high-octane pump gas. Though Jeep owners may wish to believe otherwise, AMC did not invent the seven-main bearing inline six. In fact, G.M. and Ford each abandoned four-main sixes, Chevrolet by 1963, Ford following in 1965. G.M. introduced the 194 in the compact 1962 Chevy II, Rambler’s direct competitor. The 1963 seven-main bearing 230 inline replaced the venerable ‘Stovebolt’ 235 four-main bearing engine in full-size cars and light trucks. A 250 followed in 1966. For stump-pulling truck power, the 292 inline six appeared in 1963 half-ton through 60-Series Chevrolet trucks. Interestingly, the 230, 250 and 292 share the same bore as a stock Jeep 4.0L six. The 292’s massive displacement and torque is the result of a 4.125” stroker crankshaft. (Sorry, the 292 G.M. inline six crankshaft will not fit a Jeep 4.0L block! Ford waited until 1965 to introduce its seven-main bearing 240 and legendary 300 cubic inch truck inline six. The 300 six, a utility engine that survived well into the EFI era, enjoys a 4.00” bore with a 3.98” stroke. Note: Chrysler Corporation’s advanced engineering produced the highly successful G-series, four-main bearing slant six design. Its crankshaft tucked well up in a 30-degree slanted block casting, the rugged inline came in 170 and 225 cubic inch versions produced between 1960 and 1987. The 225 slant six was a highly under-square design with a 3.40” bore and exceptional 4.125” stroke—ultimate truck power! 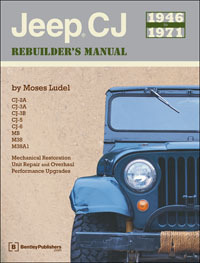 AMC’s 1964 launch of the 232 stands as a welcome milestone for three generations of loyal Jeep owners. Having annoyed Jeep mechanics with an advanced, overhead cam 230 six, Kaiser sought a basic, durable OHV inline engine. The Jeep 230 had only four main bearings, albeit large ones. Most inline six manufacturers had moved to the seven-main bearing platform. 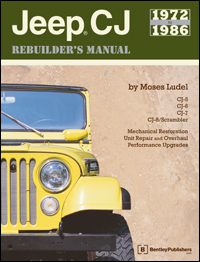 Although the U.S. military would have some success with Kaiser’s 230 OHC engines through the 1969 M715 and its variants, Jeep dealership mechanics and civilian J-truck (Gladiator) and Wagoneer customers applauded the Jeep switch to AMC’s 232 inline six in 1965. Kaiser also turned to AMC for its 327 V-8. (Do not confuse with the Chevrolet engine of similar displacement and bore/stroke sizing.) A robust 327 V-8 gave the 1965-68 Jeep Wagoneer and J-trucks a respectable power option to the 232 inline six. In 1971, AMC introduced the 258 version of its inline six. This engine turned some J-truck owners’ heads but did not reveal its true potential until the 258 (4.2L) became an AMC/Jeep CJ and I-H Scout option. The simple addition of more stroke turned a ‘Mobil Economy Run’ Rambler 232 into a torque-twisting truck engine! Note: By design, inline sixes have inherent primary and secondary balance, contributing to their smooth performance and legendary longevity. My tow vehicle of choice is a Dodge Ram with Cummins six-cylinder diesel power! Light weight, high in torque, extremely rugged, efficiently cooled, and capable of surviving the draconian emission controls of the 1980s, CJ and YJ Wrangler versions of the 258 hold top rankings as trail legends. 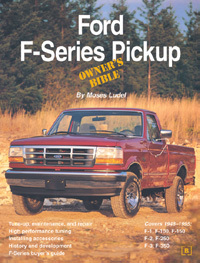 (My Jeep® Owner’s Bible™ has sung praises for the 258/4.2L since 1992.) 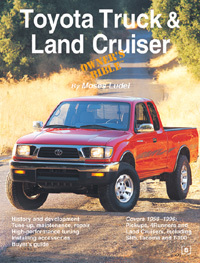 In rough terrain, 258/4.2L engines excel to this day. The marketing coup of AMC/Jeep design was the 1984 XJ Cherokee. Having minor success with the all-wheel-drive Eagle car, AMC went back to the drawing board. Revisiting Jeep utility truck successes, the XJ came forth with beam axles, a two-speed transfer case, a contemporary powertrain and a lightweight, unitized body. The result: a durable, stylish, utilitarian new product—the AMC/Jeep® compact Cherokee SUV. Despite sensible axle and transfer case choices, AMC’s 1984-86 V-6 engine option fell short. 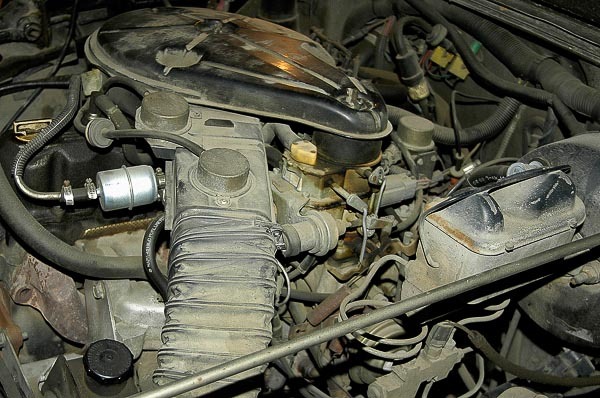 Amidst the industry trend toward downsized engines, AMC pushed aside its inline 258 six in favor of a throttle body injected (TBI), derivative 2.5L four as the base engine. The optional 2.8L metric V-6 was outsourced from Chevrolet. The five-main bearing 2.5L AMC four-banger shares inline six features. Many parts interchange with the 4.0L six. Virtually bulletproof, 2.5L fours will often deliver 200-250,000 miles of service in lightweight CJ, XJ Cherokee or Wrangler models. The 2.5L four has become its own legend. AMC’s bulletproof, five-main bearing TBI 2.5L four shares architecture with the 4.0L inline six. 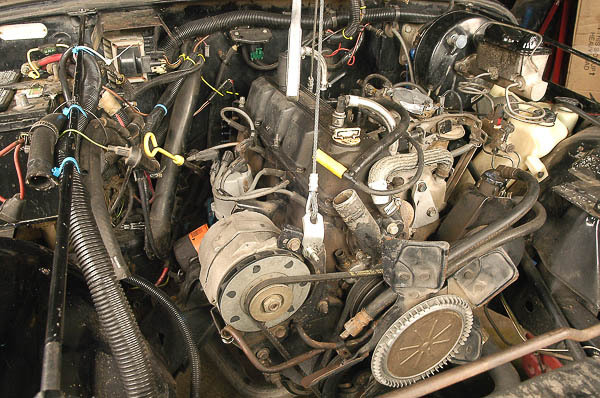 Originally carbureted in ’83-’86 CJ models, this 1987 YJ Wrangler application of the 2.5L AMC engine earned the XJ Cherokee’s TBI fuel injection. 2.8L/173 cubic inch Chevrolet V-6s suffered the same problems in the XJ Cherokee chassis that they did in the early G.M. S-trucks and S/T Blazers. The “small-journal” 2.8L crankshaft was capable of breaking, and all 2.8L V-6s used in the XJ Cherokee had these crankshafts. 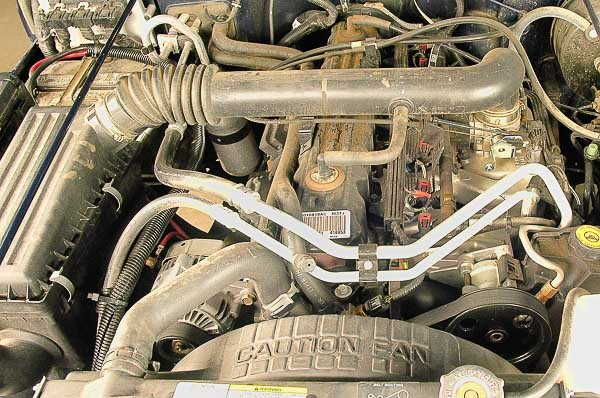 A chronic rear main seal leak was endemic to these first-generation 2.8L engines. Note: In fairness to Chevrolet, the 2.8L V-6 improved with the introduction of a large-journal crankshaft and final main seal upgrade. Unfortunately for the XJ Cherokee owners, none of these changes applied to ’84-’86 XJ Cherokee engines. AMC/Jeep® had a unique dilemma: The XJ Cherokee and an emerging MJ Comanche pickup were clearly sales successes. A quick powertrain fix was necessary. These chassis had room for an inline four or V-6, and with some squeezing of the fan spacing, an inline six would fit. To this day, many question why the 258/4.2L was not the choice. Between EPA emission control constraints, CAFE fuel and mileage standards, and an effort to satisfy crossover buyers from passenger cars to compact SUVs, a “truck engine” apparently was not acceptable. Better yet, the 2.5L four and a 4.0L six would share common bore sizing and parts. From a production standpoint, this was a compelling reason for the 4.0L configuration. 4.2L inline six-cylinder engine found its last home in 1987-1990 YJ Wranglers. Can you find the engine in the maze here? 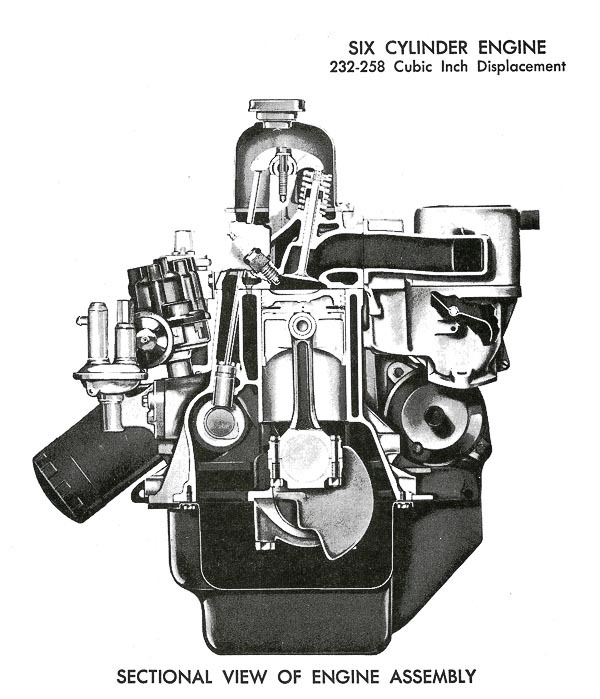 This Carter BBD-carbureted engine is similar to the later CJ Jeep version of the 4.2L/258. The 258 still had carburetion in 1987, although many to this day wonder why. AMC and its partner Renault had launched a TBI system with the XJ’s 2.5L four. Weighted with emission controls, a BBD carburetor and vacuum lines that ran in all directions, the new 1987 YJ Wrangler’s 4.2L six looked archaic next to a base model’s TBI 2.5L four. AMC/Jeep took a bold initiative with the 1987 XJ Cherokee. Boasting a multi-port fuel injection system and an over-square, wholesome displacement inline six with seven main bearings, the 4.0L six arrived. The bigger bore, shorter stroke, higher speed engine claimed 177 horsepower. That same year’s carbureted 4.2L Wrangler struggled under severe emission control detuning. Despite its useful torque output, the 4.2L/258 engine produced less peak horsepower than the TBI 2.5L four-cylinder engine. 1983-86 CJs feature the carbureted 2.5L four. 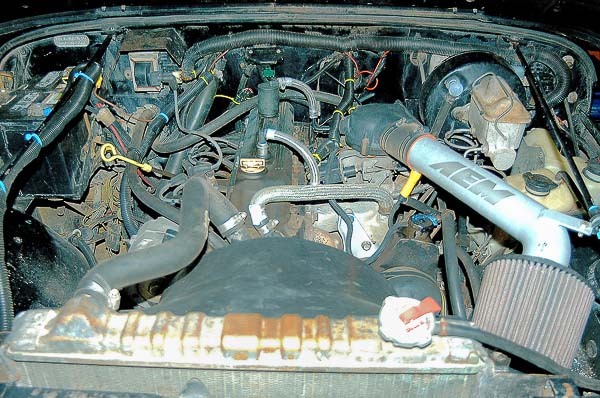 Pre-’91 XJ Cherokee and ’87-’90 YJ Wrangler offered a 2.5L TBI base engine (shown here) that delivered more horsepower than a carbureted 4.2L inline six. Many CJ and Wrangler drivers have enjoyed the 2.5L’s smooth low-range power. Not this owner, however, who is opting for an inline six swap! 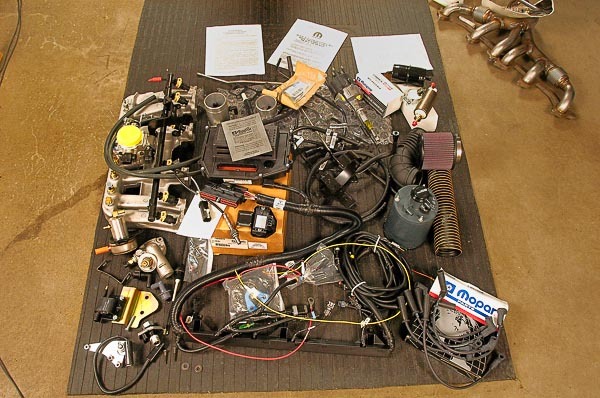 Note: Retrofitting Mopar’s multi-point EFI Conversion Kit (essentially 1995 off-the-shelf 4.0L technology) to a 1981-90 258 or 4.2L six will unleash an immediate 50-plus horsepower over the stock carburetion! As a new vehicle tester for Argus’ OFF-ROAD magazine in 1987, I evaluated the first 4.0L XJ Cherokee models. That same year, Chuck Williams and I co-drove an XJ in the Jeep® Cup Rally’s regional competition at the Sierra foothills near Placerville, California. We ran our rally vehicle up Interstate 5 from Southern California, providing a good opportunity to see what the new, 177-horsepower EFI engine could do. That horsepower was somewhat there. Immediately apparent to a veteran four-wheeler and driver of many truck-like Jeep vehicles, I discovered the 4.0L engine had reasonable mid-range to redline power, but it could barely get out from under itself in the lower rpm zone—off-idle to 2,200 rpm—the speed range vital to rock crawling. This was AMC’s gamble: an SUV engine that had enough power to maneuver in traffic or on the freeway, the XJ’s likeliest venue. The all-season 4WD models, aided by a high-low range, two-speed transfer case, could move a boat up the ramp…Flash forward a decade to lifted XJ Cherokees on the Rubicon Trail! Logic follows that transfer cases with a low enough low-range ratio can make any 4×4 a rock crawler. “In the day,” the 75 horsepower, 134 F-head four could crawl up a hill and fire, all under starter motor cranking power. In low-range, compound low gear, a T98 transmission and 40-50 available horsepower seemed like plenty at 9,000 feet elevation. In 4WD low range, the oxygen sensor-looped EFI system and a 4.0L inline six can certainly do far better. 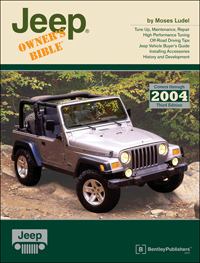 EFI-equipped 4.0L inline sixes became a YJ and TJ Wrangler (shown) mainstay from 1991-2006. This block and cylinder head provide the foundation for the 4.5L to 4.7L stroker. When the Wrangler inherited the 4.0L six in 1991, blessings were mixed. Many owners celebrated the end of carburetion, flooded engines, hard starts on the trail and quirky performance at higher altitudes. Mopar’s multi-point fuel injection instilled confidence both on- and off-pavement. Gone, though, was the 258’s time-honored truck formula for torque and bottom end power—replaced by an over-square design. AMC’s 232 and 258 engines share a common bore size of 3.750”. The 2.5L four and 4.0L six boast a stock bore of 3.875”, 0.125” larger than these earlier sixes. Stroke on the 4.0L is 3.414”. Stroke on the vintage 232 is 3.5”. Both the 232 and 4.0L (242) have an “over-square” design, a bigger bore measurement than stroke length. Under-square engines have a long history in truck applications. Over-square engines were a product of the higher-compression, leaded fuel, OHV V-8 era that spawned the muscle car horsepower race. The 4.0L’s bore/stroke dimensions provide the kind of performance that works well with lower (numerically higher) axle ratios. This contrasts directly with the EPA and CAFE standards, which generally require taller axle ratios and overdrive gearing. What is lacking in the 4.0L is bottom end power. As early as 1987, it was apparent to many of us that the 4.0L has poor torque delivery, especially below 2,500 rpm. This is obvious by the engine’s peak torque figure near 4,000 rpm. Add to that the typically taller axle gearing, and a problem exists. By contrast, the low-end torque output of a 258 is exceptional. This engine, in its emission-laden, de-tuned, final years of use, could reach maximum torque by 1600 rpm. The closest comparison to that kind of torque rise is Cummins’ 5.9L diesel—not surprisingly, a seven-main bearing inline six. Despite the perils of unleaded fuel and stiff emission constraints, the carbureted 258 survived through 1990. With taller axle gearing for EPA and CAFE compliance, the final 258/4.2L engines still met 1990 YJ Wrangler emission requirements. To build an engine that will meet both the low-end torque output of a 258 and the horsepower levels of a more contemporary, emission regulated EFI engine, the most sensible means is to meld the 242 (4.0L) bore size with the 258 (4.2L) six’s stroke length…This creates a 4.5L stroker motor. Bore the block, and we have a 4.6L at 0.030” oversize or 4.7L at 0.060” oversize. During the last two decades, innovative Jeep owners and engine builders have retrofitted the 258/4.2L crankshaft into 4.0L engine blocks. AMC’s common production methods and parts interchangeability make it possible to install the 258 crankshaft without 4.0L block modifications. If you use an early, OEM 4.2L crankshaft with a later damper, an area that needs attention is the crankshaft snout length. For some pulley dampers, either 1) the longer 4.2L snout must be shortened or 2) the installer must use an aftermarket spacer with the OEM washer and a longer damper bolt. (HESCO sells this spacer as “Crankshaft Damper Spacer #HESBS.”) New Mopar® stroker crankshafts come with the shorter, 4.0L-style snout length. For safety sake, use the correct length bolt for the damper. This solution to the weak bottom-end performance of the 4.0L encouraged Mopar Performance® to offer its 4.7L stroker long-block. 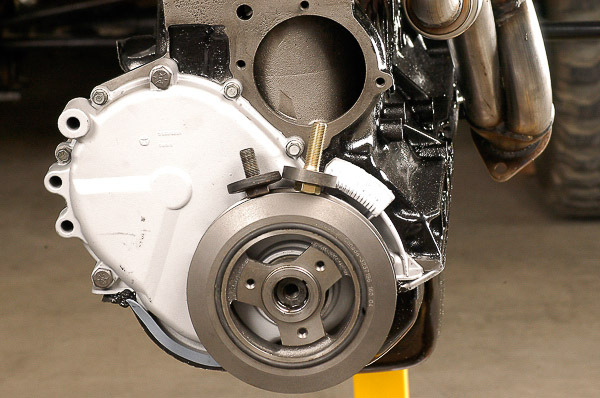 A clear gain is broad-range torque. Is the ‘stroker motor’ a new idea for AMC sixes? Hardly…Consider the bore-and-stroke configurations built at AMC’s ‘VAM’ plant in Mexico between 1969 and the ‘80s. There were 252 and 282 cubic inch engines, the latter closely resembling a modern 4.6L stroker. Using correct rods, pistons and crankshaft (stroke) with a thicker block casting to tolerate the bigger bore sizing, these larger displacement inline sixes were popular in Mexican cars and trucks that ran on low-octane fuel. The 282 block’s thicker casting accepted a 99.5mm/3.917” bore size. (U.S.-built 258 blocks will not tolerate this bore sizing.) According to several sources, VAM tested an XJ Cherokee prototype with the 282 engine as early as 1982. This allegedly inspired the 4.0L engine in 1987. (Perhaps 1984 would have been a wiser point—to avoid using the outsourced, troublesome G.M. 2.8L V-6!) Unfortunately, AMC did not fit the ‘stroker’ 258 or 282 crankshaft into the original 4.0L blocks. Here, a 4.7L stroker long-block accepts the Mopar® Performance EFI Conversion manifold. Template for this EFI conversion is the factory ’95 4.0L induction system and PCM. Mopar’s 4.7L long block, designed for off-road performance, achieves its 0.2L added displacement from a 0.060” re-bore of the stock 4.0L block. Mathematically, this equates to a 3.935″ (99.949mm) bore. With 3.895″ (98.933mm)stroke, the new dimensions of this engine are 4.657L—for most purposes close enough to call 4.7L around the Rubicon Trail campfire! 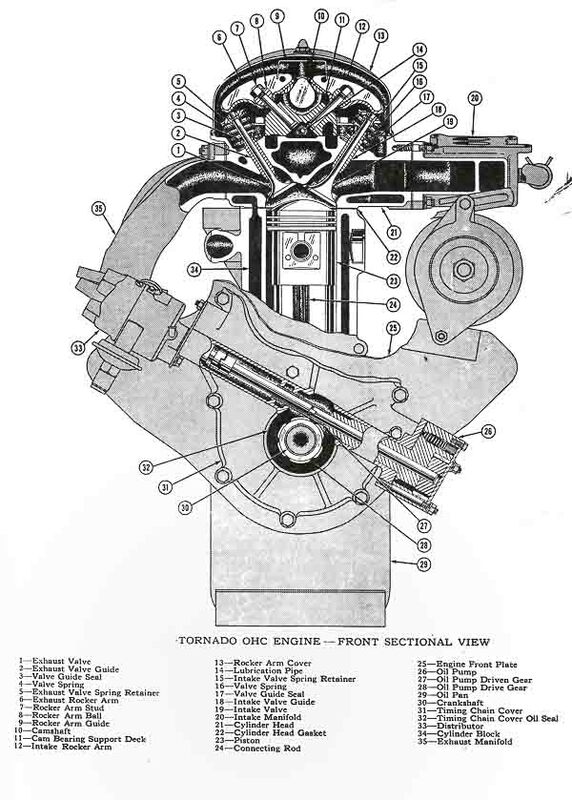 The stroker motor concept is not new. Decades ago, engine builders and designers melded the 4.0L’s over-square attributes with the legendary 4.2L bottom end torque. New Mopar stroker 4.7L crankshaft has a short snout like the 4.0L design. Long bolt and correct washer are necessary for a V-belt style Mopar EFI Conversion 4.2L/258 style damper. Match the bolt length and washer to your crankshaft snout. Installation of a 4.2L crankshaft into a 4.0L block is so effective that users often claim more useful performance from this gesture than supercharging. Supercharging or turbocharging can produce exceptional results—in the mid- and high-rpm realms. For stump-pulling torque at idle and tip-in rpm, however, there is no change better than a stroker crankshaft. Note: One place where supercharging excels is at higher altitude. Supercharging will compress “thin air” and offset the lack of atmosphere. While oxygen-sensed EFI maintains the air/fuel ratio, supercharging compensates for the rarified atmospheric conditions and boosts manifold pressure. Here, the 4.7L stroker long-block gets ready for installation in an ’81-’90 4.2L chassis. Mopar EFI Conversion pulley with crankshaft sensor pickup bridges the 4.0L versus 4.2L gap. Oil pan, pump and pickup screen must match the chassis. 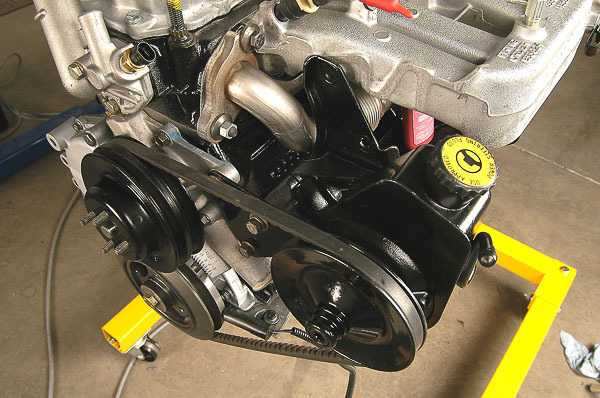 Mopar® Performance considered the basic formulas for a stroker long block. As the same engineers who design Jeep® vehicles, they set out to build a virtual turn-key installation. The 4.7L long block fits precisely like the original 4.0L long block in several popular model applications. Using select OEM and aftermarket parts to build these stroker motors, Mopar® has provided an optimal performance package. Starting with premium remanufacturing processes and well-matched components, Mopar® Performance has targeted off-road Jeep® users. 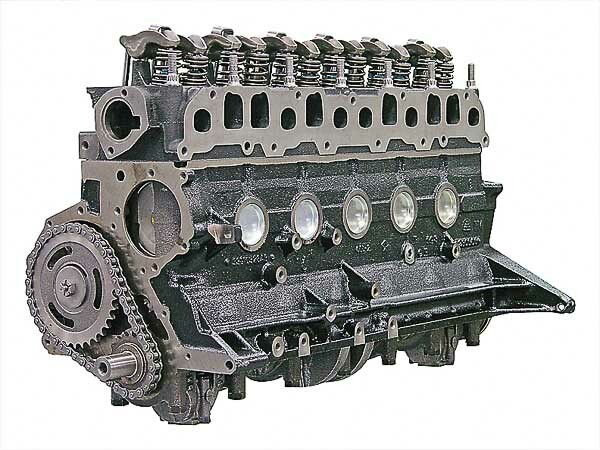 The process begins with a complete remanufacturing of the block assembly and, when cores offer the right cylinder head design, careful rebuilding of a tested, OEM cylinder head casting. Head work includes three-angle valve seats, premium valves, renewed guides, springs, keepers, rocker arms and sized pushrods. Any reused parts receive reconditioning. For later generation 4.0L engines with the less desirable, smaller port head, Mopar retrofits a new, earlier design cylinder head assembly. All Mopar® Performance 4.7L long blocks have a cylinder head that flows properly for the increased displacement. Precisely bored and honed cylinders finish at 0.060” over stock, creating the 4.7L displacement. Forged pistons readily bump compression to 9.6:1 with the longer piston stroke filling the combustion chambers. Rods are production type, machined to exact tolerances. The crankshaft is a brand new, cast-type design, providing the 3.895” stroke dimension that made the 258 six famous. A four-counterweight, balanced and fitted assembly, the crankshaft matches the rod and piston choice. All new bearings are premium quality. Blending traditional Jeep® reliability with high performance objectives, the camshaft adds just enough lift and duration to support the compression ratio and “square” bore/stroke configuration of the engine. The tested profile selected by Mopar® Performance provides a wider torque band and better breathing in the mid- to high-rpm ranges. The goal with this engine is maximizing horsepower and torque without sacrificing smooth off-idle performance—the key to rock-crawling success. For valve timing accuracy, a new roller chain and sprockets spin the flat tappet, hydraulic lifter camshaft. No detail left to chance, the oil pump is a new, high volume design with a new pickup screen. Parts interchangeability between 4.2L, 2.5L and 4.0L engines enable fitment of the Mopar 4.7L long block into a pre-1991 chassis. Mopar Performance does not endorse or assist with these retrofits; however, a perceptive engine swapper can find the commonality in many parts. Here, slightly modified, 1987 V-belt 2.5L brackets fit neatly onto front of 4.7L long block. 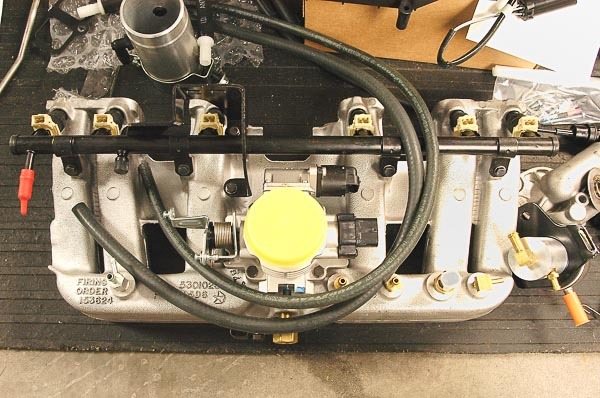 The long-block ships without a valve cover, timing cover, manifolds, distributor or oil pan. Installers must match up the oil pan type. For a retrofit into Jeep models not directly targeted by Mopar’s program, the oil pan, pump and pickup screen must match the original engine and its chassis configuration. If a 1991-2006 Jeep model is specifically listed for a Mopar 4.7L long-block part number, the installer simply cleans and transfers parts from the original long-block to the new one. Note: There are several ways to build your stroker inline six, using various parts combinations. 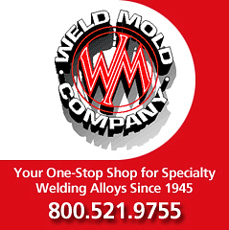 In the ‘Q & A’ and other articles, I cover these distinctions and the parts options available. The Mopar Performance long-block program aims at simplifying installation. With such a large cohort of Jeep vehicles in each part number category, Mopar Performance demystifies the applications and installation requirements. This is long overdue for 4.5L to 4.8L inline six buildups. Are you searching for a virtual turn-key approach? If your Jeep fits one of the part number categories, transferring peripheral pieces from your current engine directly onto the Mopar 4.7L long-block will be a straightforward task. Of course, you’ll want to clean transfer parts thoroughly and make sure they are in top condition. Approach this installation as you would any new engine, following factory guidelines for the transfer of parts. Starter motor and alternator must be in top condition. Mopar® remanufactured, 4.0L starter motor, available through your local Jeep dealership, assures reliable cranking torque for the fresh, 9.6:1 compression engine. You’ll also want to change the fuel injectors. To fuel the new, nearly square (3.935” bore with 3.895” stroke) 4.7L inline engine, Mopar® Performance has done the homework. Furnished with the long-block are installation details, including the Mopar Performance part numbers for the injectors that will properly fuel this potent powerplant. The intent, as one might expect from a factory effort, is to make this installation as trouble-free as possible. What Do I Think of This Approach? As a four-wheeler who values torque at lower speeds, I wholly endorse the stroker approach. In fact, I would not rebuild a 4.0L inline six without installing, at the bare minimum, a 4.2L stroker crankshaft with appropriate pistons and an ‘H.O.’ cylinder head. For any year Jeep chassis, I would use factory MPI or a Mopar® EFI Conversion. Optimal induction system is a 4.0L multi-point injection system. Installers using the 4.7L stroker long-block will find the 4.2L/258 Mopar® Performance EFI Conversion very practical for a 1990-back chassis. One modification for the long-block is use of the Mopar® Performance recommended injectors. The 4.7L engine requires more fuel flow than stock. An adjustable, aftermarket pressure regulator is available for systems with a return fuel rail (two-rail). This is not necessary for the single rail (non-return style) later MPI systems. The ’99 XJ Cherokee that graces 4WD Mechanix© Magazine pages, a vehicle at ease on rock piles or making time across a washboard road in the high desert, is a great candidate for a stroker long-block. A Mopar® Performance long-block offers the research, attention to detail and quality workmanship that could clinch the deal. Are you looking for a broad power band, torque to satisfy bottom end rock crawling or horsepower for making tracks over a desert playa with a tent trailer in tow? Do you prefer a compression ratio below the engine’s detonation threshold? Or matched components like a fresh crankshaft, rods, pistons, camshaft and cylinder head? If your expectations coincide with the Mopar® Performance 4.7L design intent, by all means, consider this turnkey long-block! 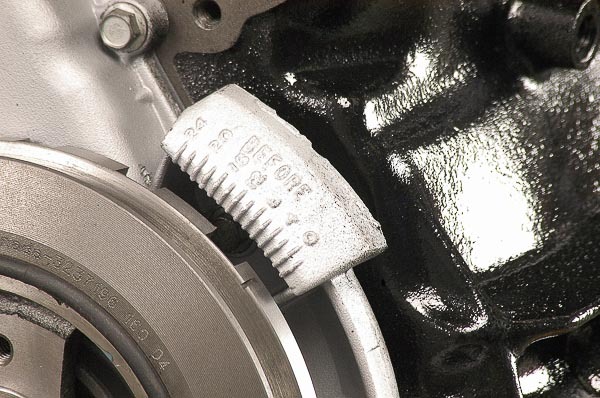 Commonality between 4.2L, 2.5L and 4.0L engines makes flywheel and clutch fit-up easier. Use the correct pilot bearing for your manual transmission. Mopar’s 4.7L crankshaft comes balanced. I also balance the damper, flywheel and clutch cover. 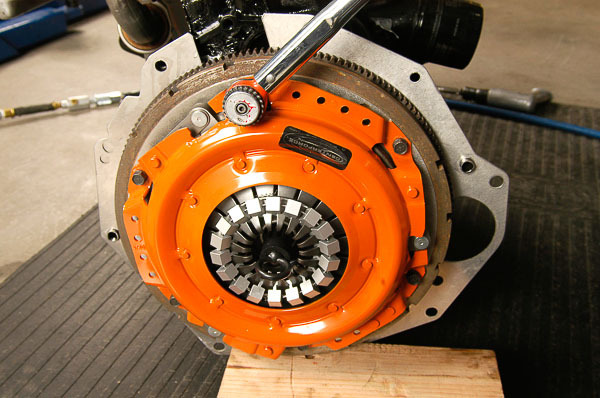 An upgrade Centerforce II clutch (shown) assures maximum performance. Specifically, the Mopar® Performance research has targeted off-road enthusiasts who expect better performance across the board. The combination of a longer stroke and 9.6:1 compression, coupled with a tested camshaft profile and free-breathing cylinder head, will yield more horsepower and torque from lower speeds all the way to redline. This manageable kind of power can compensate for additional equipment and accessories weight, oversized tires and multi-use axle gearing. Mopar® Performance offers a flexible, all-around performance engine that serves a wide cross-section of off-road users. The 4.7L long-block’s engineering reflects a feel for Jeep driving environments and an awareness of those areas where the 4.0L engine needed improvement. 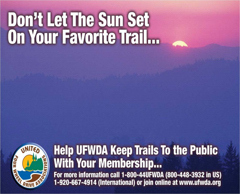 This product is thoroughly tested and endorsed by the same folks who design and develop Jeep off-road vehicles. 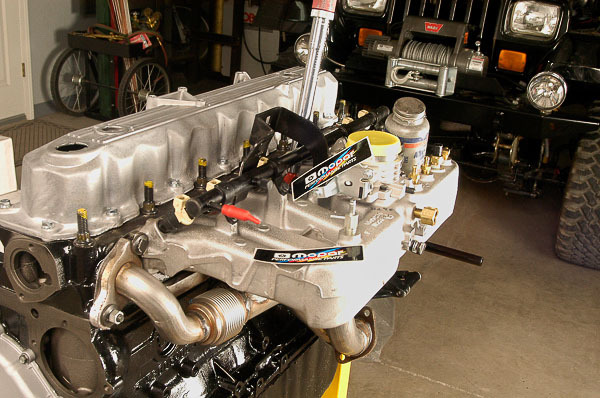 If you want a properly built, quality engine package that can be fitted to your Jeep in as little as a weekend—or a few hours at a JeepSpeed Cup or VORRA racing pit—this is a program to consider! Here is the complete 4.7L stroker ready for installation in an ’87 YJ Wrangler chassis. I did a “blueprint” rebuild of a Jeep/Aisin AX-15 five-speed (overdrive) transmission to meet the torque and horsepower demands of a high output engine. (To see my ‘how-to’ article on that AX-15 rebuild, click here.) A new, tubular steel Mopar® “factory” exhaust manifold fits well with the 50-State legal Mopar® Performance EFI Conversion—impressive Mopar, congratulations! Note: Mopar has targeted the YJ and TJ Wrangler and XJ Cherokee owners with its 4.7L long-engine. Considering the ample amount of parts interchangeability between the 4.2L and 4.0L sixes, installing a 4.5L to 4.7L stroker package into a 1972-up CJ Jeep—or a 1965-up FSJ model—is also possible. Use the correct peripheral parts for your year and model Jeep application. 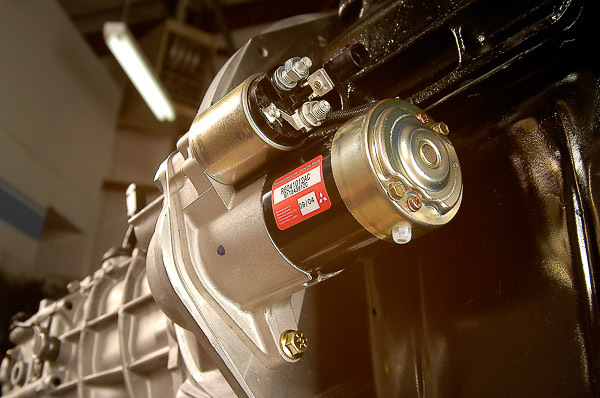 You have a wide selection of original and aftermarket transmission options, including the available Jeep and aftermarket manual and automatic types.